Look at them again. Can you see the other? As humans we encounter many things each day as our senses are constantly processing data. For example, the bottom of our feet can simultaneously distinguish contact with a sock, the inside of the shoe, the surface on which one is standing or moving. Our senses allow us to experience the world around us. Take a moment to think of all the things you perceive on a daily basis. Perception is about our sensory experience of the world around us and involves both the recognition of environmental stimuli and actions in response to these stimuli. Perceptions include the organization, identification and interpretation of sensory information in order to represent and understand the environment. What the short video below. All perception involves signals in the nervous system, which in turn result from physical stimulation of the sense organs. Perception depends on complex functions of the nervous system, but subjectively seems mostly effortless because this processing happens outside conscious awareness. Perception is influenced by past experiences, the situation, the expectation, and the intensity of the perception. Watch the last video for the final test. Science is not an opinion. Science is not a theology. Science is not a belief system. Science is not a theory. Science is not a political view. Science is not a trend. Science is a way of knowing. Science is limited to the human perspective. Science finds patterns and connections. Science is a search for explanations of what we observe in nature. Think about it – Disagreement around scientific topics is common in our lives. Whether it be evolution, climate change, vaccines deforestation, energy resources, or environmental standards (to name a few), a sizable number of people reject aspects of science for a variety of reasons – especially political, theological, and/or other ideological views … all reasons that are not science. Recently, President Obama overruled the EPA and ordered the EPA director to withdraw a proposal regulating health-based standards for smog-forming ozone. Pro-business people are delighted and pro-environment constituents aren’t happy. The Setting: If no environmental controls existed, we pay a lot for environmental damage. If we had a life free from environmental damages, we pay a lot for environmental control. The Key Questions: How much are we willing to pay in cost of damages? How much are will willing to pay in cost of controls? Whenever costs are involved, human nature wanting the lowest possible cost is quite predictable – which is one reason why I appreciate this graph. 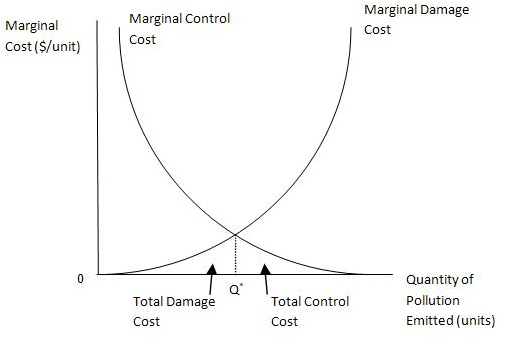 Not only does it illustrate the lowest possible cost, but it also identifies the amount of accepted pollution (thus environmental costs) associated with that cost. May I also note that the cost lines are curved, not linear. The US EPA is the regulatory agency responsible for developing, implementing, and enforcing the regulations to comply with legislation passed by Congress. Interestingly, the White House directly controls the EPA, thus enforcement directly correlates to the party in power and subject to political pressure. Some presidential administrations use Executive Orders to get around the guidelines by reducing EPA enforcement or to increase enforcement. Meanwhile, some candidates campaign to eliminate the EPA. Without the EPA, our society would rely on the thoughtful nature of the business community to maintain quality air, water, soil, and all other natural resources. Let us not forget the years of burning rivers, poor visibility, waterways with limited life, and other aspects of poor environmental quality. Yes, those of us of a certain age remember those times – but anyone watching the 2008 Summer Olympics from Beijing can recall the images of their atmosphere. There is no question that environmental controls can be expensive to business – and the stricter the regulation, the higher the preventative cost. However, I end this with these difficult questions: If control costs are too expensive, can control costs become prohibitive to the business? Is there a reasonable balance point regarding preventative costs and acceptable damage? Should the White House continue to control the EPA?